The new era of selling has arrived with technology-empowered and information-savvy customers dictating which businesses thrive and which fail. Despite the transformation to an intelligent marketplace, siloed sales and operations teams are scrambling in the background to deliver competitive, custom-tailored proposals and scopes of work (SOWs). Given that the customer experience is now the benchmark of success, it makes us wonder — how are companies taking the pressure off sales teams and empowering them to be the knowledgeable, expedient, and nimble facilitators that today’s buyers expect? There’s proof to back the dire need for change. According to SalesForce’s State of Sales Report, which surveyed over 3,100 global sales professionals, 73% felt that collaborating across departments is absolutely critical or very important to their overall sales process. For sales teams to be successful in closing business, they must fundamentally change how they sell, including the workflow technology tools that enable sales teams to pull information from various sources to create compelling, competitive and accurate proposals. Microsoft integrations aren’t new to us – we’ve already experienced huge benefits from integrating SDA with Microsoft Office. By automating document generation and pushing information out of Excel and into Word – instead of a PDF or Crystal Report – users have had the flexibility to further customize their outputs. For some companies, basic functions for simplifying the quoting and proposal process might have been enough, but we wanted to truly transform the sales process. To overcome sales’ collaboration hurdles and break down silos, we needed a way to bring all sales documents to a central cloud location for easy file handling and accessibility across departments. For the sales department, a proposal isn’t just one document, it’s an amalgamation of content pieces — Visio diagrams, internal customer notes, pricing sheets, and more. By integrating with SharePoint, SDA users can now access cloud-based folders that house all of the pertinent files and details, so questions like “Is the pricing correct?” or “What did we promise the customer?” are easily answered. 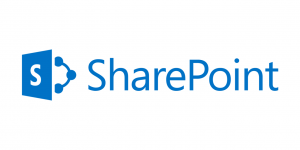 Why SharePoint Over Other Collaboration Platforms? Choosing a collaboration platform where our clients could save, secure, and share documents from a cloud environment was a decision we didn’t take lightly. Since Microsoft Office 365 was created to encourage and improve teamwork for business, and so many of our customers already use the productivity suite, SharePoint seemed like a natural fit. While past versions of SharePoint have been considered complex, Microsoft has made great strides in simplifying the interface and functionality of its file management and workflow capabilities. Tethering salespeople to their desks as a requirement for accessing their sales opportunities and quotes is the farthest thing from reality. Today’s salesforce is on the go, often needing to work when the corporate network – or perhaps even the internet – isn’t available. In 2015, we solved this problem by creating the SDA Dashboard, hosted by Amazon Web Services, and offline/online file handling. This stop on our roadmap allowed users to create and update quotes at the desktop while offline, then automatically push data to the SDA Dashboard and the quote/output files to a network or shared drive once they were back online. Today we’ve extended that functionality and further automated SDA by centralizing file management in the cloud with SharePoint, allowing mobile employees to work where they want, when they want. 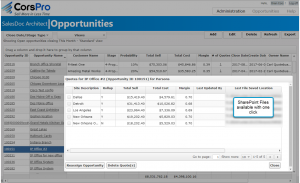 Also, users have a view of all opportunities and their associated quote files, output files, and other project files. Even in the cases of bigger projects, if a sales person is not available, managers or other collaborators can access the files with just a few clicks. Collaboration tools are only effective if all team members can actually find the files. To ensure that quotes or output files are never misplaced and always accessible, SDA has auto-naming and auto-saving features so that users don’t need to think about what to name a file, or where to save it in SharePoint. SDA auto-names and auto-saves all quote and output files to SharePoint, also pushing additional metadata to SharePoint to enhance the ability of users to filter the files they’d like to see in SharePoint. With an automatic company-wide naming scheme, each collaborator will able to easily locate files within SharePoint. This streamlined functionality means that contributors like management or engineering can quickly review and approve quotes before users generate a proposal, SOW, or other output, eliminating the need to redo incorrect or incomplete work. SharePoint is the foundation of Microsoft Teams, which offers Slack-like collaboration, so you don’t just benefit from the cloud-based co-location of files, eSignature services, and online/offline data and file management, but also real-time chat and collaboration features. With SharePoint and SDA, it’s all about simplifying the workflow. Users can check out and check in documents, and initiate approvals and workflow rules. Using Excel formulas (no programmers required!! ), an SDA administrator can configure SDA to require sales manager approval for quotes priced below a certain margin, or if a sales engineer needs to review specific types of solutions. Even better, an email that lists the reasons for required approval that includes a hyperlink to open the quote file for review, can be auto-generated to cut down on time chasing approvals and hunting down quote files. Whether you’re working on bigger projects that require input from multiple teams or you just need a more efficient way to manage your quoting and proposal process, SDA and SharePoint are here to alleviate what’s zapping your productivity. Experience a seamless sales process like never before!! Want to see it for yourself? 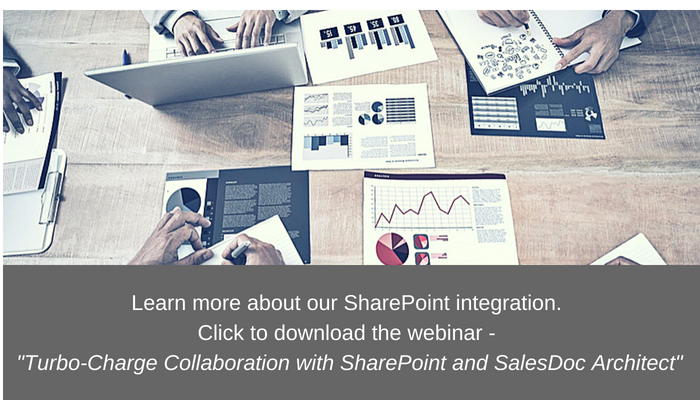 Watch the video of our “Turbo-charge Collaboration with SharePoint and SalesDoc Architect” webinar to see how SharePoint and SDA work together to turbo-charge collaboration across your organization and with prospects and customers.